^ UCLA.edu - East of Campus. Accessed 08 December 2011. ^ West Hollywood Marketing and Visitors Bureau - Hollywood Info. Accessed 08 December 2011. 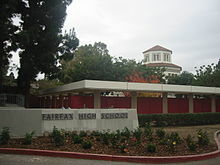 ^ Fodor's California 2007. New York: Random House. ^ The vacancy-control part of this ordinance has since been rendered null by an act of the state legislature in the early 1990s called Costa-Hawkins that effectively ended "strong" rent control measures in California. ^ Robin Williams, television biography from the Biography Channel, 7/7/06. ^ "West Hollywood Station." Los Angeles County Sheriff's Department. Retrieved on January 21, 2010. ^ "Hollywood-Wilshire Health Center." Los Angeles County Department of Health Services. Retrieved on March 18, 2010. ^ "West Hollywood Library." County of Los Angeles Public Library. Retrieved on December 2, 2011. ^ Stukin, Stacie. (26 September 2011). "WEHO NO". The Architect's Newspaper. Accessed 02 December 2011. ^ Branson-Potts, Hailey. (01 October 2011). 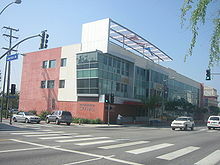 "West Hollywood Library's new edition". Los Angeles Times. Accessed 02 December 2011. ^ Hawthorne, Christopher. (28 September 2011). "Architecture Review: West Hollywood Library among top works". Los Angeles Times. Accessed 02 December 2011. ^ Ng, David. (27 July 2011). "Entertainment: Shepard Fairey, street artists brighten West Hollywood library". Los Angeles Times. Accessed May 15, 2012. ^ Census figures from 1960 to 1980 were enumerated prior to incorporation as West Hollywood CDP. Kenney, Moira (2001). Mapping Gay L.A.: The Intersection of Place and Politics. Temple University Press. ISBN 1-56639-884-3. Teal, Donn (1971, reissued 1995). The Gay Militants: How Gay Liberation Began in America, 1969–1971. New York, St. Martin's Press. ISBN 0-312-11279-3 (1995 edition).